Shopping around on Oxford street this week has been lethal! There is so much amazing product hitting down for Christmas that my wantlist could go on and on! 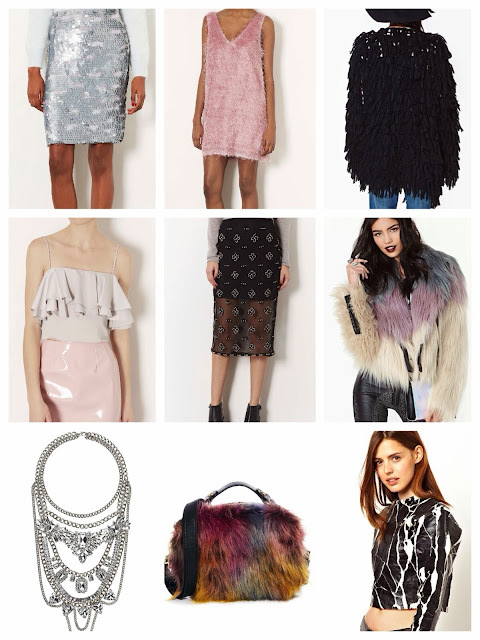 Topshop has really stepped up with statement sparkly and embellished pieces and it makes me want it to be Christmas Day everyday! This is the perfect skirt to dress up or down. I think it will look amazing with a chunky knit jumper and a killer pair of boots for the day or fur and heels for night. Either way it's perfect to add some sparkle to the festive season. I brought the white white version of this a few years ago and have worn it lots. The pink is bang on trend and it looks great with a leather jacket over it. A simple dress with gorgeous texture and at £50 it's a style steal! Could I really have anymore texture in my wardrobe? YES!! Texture is more important than print this season so really layer up to create dramatic and head turning outfits. This is gorgeous for the party season team it with a statement sequin, embellished or PVC skirt and fur coat, the perfect work Christmas party get up! Another amazing skirt from Topshop and perfect for Christmas time. Again sequin trophy skirts are meant to be worn like style icon Alexa Chung with an oversized chunky knit perfect for that casual/dressy balance. I'm a sucker for a coloured fur jacket, infact if I could have a wardrobe full of rainbow fur I would! This one is gorgeous and really unusual colours, you can always rely on Nasty Gal for unique pieces! Statement necklace are great to throw on with a jumper and still sparkle. This is perfect being both edgy with the silver chains and sparkly with the diamonds. Nothing's better than diamonds and fur! Fur bags are all over the high street at the moment, head to River Island and Topshop for a good variety. Although ASOS won over my heart with this quirky, bright fluffy bag which if perfect to add a statement and some fun to any winter outfit. I think this is such a great piece and it looks so high end! At £35 it's a definite investment piece, oh ASOS you do spoil us with your wonderful product! Love the Nasty Gal jacket!